Copyright 2014 © Laraine Flemming. Distribution and redistribution for commercial purposes are strictly prohibited. Use for non-commercial educational purposes is permitted, provided that this copyright notice is not removed. As a courtesy, please notify us if you link to our site. Directions: Survey the following reading section by section. Read the title, headings, and introduction, along with the first and last sentence of each of the remaining paragraphs. Answer the questions following each section. When you are finished, read through the entire selection and see if you can answer the questions at the end of the reading. Misguided "Friends of the Indian"
1Custer's "last stand" was a turning point in the country's attitude toward the Indian tribes who had first owned the land white settlers now considered their own. Outraged by Custer's humiliating defeat, there were many in the country who claimed that the only good Indian was a dead Indian. Horrified by such a bloodthirsty attitude toward their fellow human beings, pro-Indian groups rose up around the country to defend the lives of Native-Americans. Calling themselves "Friends of the Indian," members of these groups insisted that, with a little help from their white brothers and sisters, Indians could become upstanding members of white civilization. Well-meaning but completely ignorant of the people and culture they were trying to help, the Friends of the Indian waged a campaign that brought Native-Americans little more than misery, pain, and humiliation. Upon reading the title and introduction, which point do you predict will be further developed in the following paragraphs? a. Custer's arrogant underestimation of Indian forces was the cause of his defeat. b. In response to Custer's defeat, many Americans were consumed by hatred of the Indians. c. In the end, those who called themselves "Friends of the Indian" did more harm than good. 2On June 25, 1876, the thirty-six-year-old Civil War hero Major General George Armstrong Custer rode into battle against a combined force of Sioux and Cheyenne Indians camped close to Montana's Little Bighorn river. Gold had been discovered in the nearby Black Hills, and it was Custer's job to see to it that the Sioux Indians, to whom the land belonged by treaty, stopped attacking the gold miners pouring into the region. Although skirmishes in the Black Hills had been growing steadily more dangerous since the Sioux and Cheyenne had begun working in tandem, Custer was confident of victory and didn't bother to wait for reinforcements. What Custer didn't know was that he had badly underestimated the size of the Indian camp. He was expecting a few hundred but, in fact, almost triple that number met his attack. Within a matter of hours, the Battle of Little Bighorn was over, and the only thing left alive from Custer's entire regiment of 256 men was one horse. Even worse, every soldier had been stripped naked and, except for Custer, scalped. Custer's scalp may have been spared because he wasn't in uniform. He was dressed in buckskin. Thus, the Indians may have mistaken Custer for a local scout and left his scalp intact. 3Custer's Last Stand, as the debacle came to be called, unleashed an avalanche of public fury, which boded no good for the Native Americans living on the western Plains. For those sympathetic to the Indians, the fear was that the government, goaded by public demands for vengeance, might pursue a policy of total annihilation. However, the battle at Little Bighorn had a second consequence: It also re-energized social reformers, who had been arguing for decades that assimilating the Plains Indians through education was the best way to end the bloody and costly confrontations between Native Americans and the U.S. military. In the past, government officials had paid lip service to the idea. But now, with Custer's devastating defeat staring them in the face, those same government officials were ready to listen. More to the point, they were ready to act. In the wake of Custer's humiliating and bloody failure, the American government began moving away from the use of force to subdue the Plains Indians. The new federal goal was to educate the Indians and thereby assimilate them into white culture. Unfortunately, the federal government's policy shift, despite offering Native-Americans a few economic incentives, proved devastating to the Indian tribes living on the western Plains. Given the introduction and the heading for section 2, which of the following questions should you try to answer about section 2? a. What made Custer feel so confident about winning? b. What were the consequences of Custer's humiliating defeat? c. How did Custer underestimate the forces he was facing? After reading the last sentence of section 2, which question do you think the author will try to answer in the section that follows? a. What was the federal government's education policy for those who were white rather than Native-American? b. What were the economic incentives? c. How did the government's policy shift prove devastating? 4At the time the American government had its change of heart, one of its own, Army Captain Richard C. Pratt, was on hand to provide a ready-to-implement educational model. In the military, Pratt had worked with Indian scouts and thought highly of their abilities. He believed that Indians, with the appropriate training, could achieve the level of "civilization" attained by white people and abandon what he openly referred to as their "savagery." In 1879 Pratt had his chance to prove that the red man could become white when he convinced the Secretary of War to let him open the Carlisle Industrial Training School in Carlisle, Pennsylvania. Pratt even had a motto ready, which summed up his educational objective: "Kill the Indian in him and save the man." 5Thus, at the Carlisle Institute, attended by Indian students as young as three and as old as sixteen, native languages were banned along with all signs of Native-American dress, custom or worship. This was Pratt?s way of, in his words, planting "treason to the tribe and loyalty to the nation at large." While some basic academics were part of the curriculum, the emphasis was on agricultural labor, with students being sent to local farmers and other businesses to learn a trade and collect a small wage. 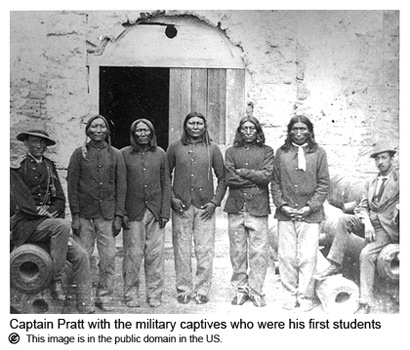 6	Although those who attended Pratt's school have left behind testimony suggesting they did not share his conviction that the school was an overwhelming success, Pratt persuaded the administrators of Indian Affairs in Washington that assimilation based on his military model of schooling would solve what was commonly referred to as "the Indian problem." As a result, the school at Carlisle became the standard for all the other government-sponsored Indian boarding schools that were soon to fan out throughout the nation as the ideology of assimilation took increasing hold. By the century's end, there would be over one hundred and fifty Indian boarding schools, with at least one quarter of them explicitly following the Carlisle model, and the rest introducing some variations on Pratt's training. In one thing, though, none of the schools deviated: Their common goal was to obliterate all traces of the children's Indian identity. 7According to the pattern Pratt developed for the Carlisle Institute, the government's boarding schools were purposely set up far from the children's homes. Thus there was no chance that they could be tainted by contact with their parents. Upon arrival at boarding school, students generally got new names like Thomas Jefferson Price or George Washington Brown. They then had their haircut and were issued uniforms or hand-me-down European clothing. As part of their training, Indian children attended Christian services, learned to speak and read English, and were taught basic vocational skills. Most importantly, they were forbidden to speak their own language or carry on any Indian traditions, such as the wearing of traditional medicine bundles, which were small bags containing objects gathered from the natural world. To do so was considered a dangerous symptom of "returning to the blanket," i.e., showing an attachment to tribal customs or rituals. 8Implementing the Carlisle model meant that every attempt to "return to the blanket" had to be stamped out through rebuke, penalty or punishment. It depended on the school which measure was taken. Some students who were caught speaking their native tongue got only a reprimand, while others reported having their hands strapped raw for speaking in their own language. In boarding schools with the harshest regimes, runaways were sometimes placed in solitary detention or forced to cut an acre of grass with scissors. Boys who ran away might have their heads shaved and be made to stand in the schoolyard wearing a dress. Students of both sexes were forced to eat lye soap for uttering even a few words of a tribal language. As one female student recalled, "Mother Garrett [the boarding school matron] jerked me by the collar of my dress and dragged me into the bathroom. That lye soap was about that big and about that high. She said, 'Don't you ever speak Indian again, or I'm going to wash your mouth again . . .' My tongue got blistered from that lye." 9Despite the harsh treatment they received, for many students, the schools still offered a way out of what was otherwise a hopeless future with no way to eke out a living on or off the reservation. In fact, school records show that some Indian boarding schools were swamped with applications made by parents eager to help their children find a place in what had become a white man's world. Based on what you read of Section 3, which of the following statements do you consider accurate? a. Richard C. Pratt was a racist who detested Native-Americans and wanted to destroy them. b. Richard C. Pratt was so enraged by the humiliation of Custer's Last Stand, he vowed vengeance on all Native-Americans. c. Richard C. Pratt may well have believed that his educational methods were helping Native-Americans by showing them how to fit into white culture; but, in fact, Pratt's educational model did a great deal of harm. 10What the school records say less about is what happened when parents, despite the financial advantages, didn't want their children to become assimilated. Some did not. But refusal was not an option. Parents who tried to keep their children out of boarding schools had them taken away by force. By 1931, nearly one-third of all children belonging to the western tribes were in boarding schools either on or off the reservations. 11Yet despite the proliferation of Indian boarding schools in the West, what Captain Pratt and those who followed in his path seem not to have realized is that giving up all external expressions of one's ethnic history does not mean the past is forgotten or less cherished. As a former boarding school student, Mitch Walking Elk, explained it, "They put me in the boarding school and they cut off all my hair, gave me an education, but the Apache's still in there." 12Even more revealing is the story of Chehia Red Arrow, who freely acknowledges, in her memoirs, that her education at the Phoenix Indian School in Arizona, prepared her "to bring in money from the white man's world." But acknowledging the value of what she had learned at the boarding school does not in any way mean that Chehia Red Arrow, or, as she was called at school, Anna Moore, had forgotten her true identity. Years later, after leaving the boarding school and raising her family, Chehia Red Arrow helped start a tribal newsletter. She was also a founder of the Pima Indian Museum; editor of a little book called Pima Indian Legends; and author of A Pima Past, her autobiography. When it was safe to do so, Anna Moore had returned to the blanket after all. Based on your survey up to this point, which of the following statements is correct? a. All Indian children forced to attend schools modeled according to Pratt's educational requirements were psychologically ruined for life. b. Bad as Pratt's educational model sounds, some Native-Americans thought it had some value for their future. 13By the nineteen thirties, the federal government had, for all practical purposes, abandoned Indian boarding schools. Most importantly, it had abandoned the Carlisle model. The new Commissioner of Indian Affairs was a social worker and amateur anthropologist named John Collier. Collier had lived with the Pueblo Indians in Taos, New Mexico and learned to respect Native-American traditions. Unlike Pratt and the nineteenth-century reformers, many of whom proudly called themselves "Friends of the Indian," Collier really was one. Thanks to him, the 1934 Indian Reorganization Act dramatically changed federal policy in an attempt to let America's Indians, in Collier's words, "lead self-respecting, organized lives in harmony with their own aims and ideals." Based on your survey of this paragraph, what can you assume about Collier's attitude toward the Native-American boarding schools? a. John Collier did not approve of the schools, and he helped change the U.S. government's attitude toward them. b. John Collier followed in Pratt's footsteps and encouraged the start of more schools patterned on the Carlisle model. c. Although John Collier disapproved of Pratt's Carlisle model, the federal government continued to fund boarding schools based on that model. Directions. Go back and re-read the selection from beginning to end. Then answer the comprehension questions that follow. 1. Which of the following statements qualifies as the best thesis statement for the reading? a. Custer's last stand was a turning point in the country's attitude toward the Indian tribes who had first owned the land white settlers now considered their own. Outraged by Custer's humiliating defeat, there were many in the country who claimed that the only good Indian was a dead Indian. b. On June 25, 1876, the thirty-six-year-old Civil War hero Major General George Armstrong Custer rode into battle against a combined force of Sioux and Cheyenne Indians camped close to Montana's Little Bighorn river. c. In the wake of Custer's humiliating and bloody failure, the American government began moving away from the use of force to subdue the Plains Indians. The new federal goal was to educate the Indians and thereby assimilate them into white culture. Unfortunately, that policy shift, despite offering Native-Americans a few economic incentives, proved devastating to the Indian tribes living on the western Plains. 2. What question about the thesis statement do the supporting details answer for the reader? a. What was humiliating about Custer's defeat? b. What had been the government's federal policy prior to Custer's Last Stand? c. What was the new policy and how did it harm Native-Americans? 3. When learning the names introduced in this reading, which of the following four would be least important? 4. Read the following paragraph. Then indicate what key point of the reading it supports. a. The goal of the Carlisle model was to separate Indian children from their native culture, and those in charge of the boarding schools used cruel methods to achieve that goal. b. The boarding schools Pratt envisioned were designed to make Native-Americans into an obedient and cheap labor force. c. The Carlisle model that Pratt developed was unconsciously inspired by Pratt's negative experiences with Native-Americans he worked with in the army. d. Unlike John Collier, the Commissioner of Indian Affairs, Richard C. Pratt had no respect for Native-American culture. 5. How would you describe the purpose of this reading? a. The purpose is to describe how the United States government tried to deal with the violent prejudice against Native-Americans that arose following Custer's humiliating defeat. b. The purpose is to inform readers about late nineteenth-century and early-twentieth century schools for Native-Americans. c. The purpose is to convince readers that the federal government's funding of boarding schools for Native-Americans was only a disguise for its attempts to destroy Indian culture. d. The purpose is to persuade readers that the boarding schools for Indians, funded by the U.S. government, were fueled by good intentions but still had disastrous results. Note: If you are interested in this subject and would like to read and hear more, consider this website, which offers, in text and audio, a moving description of what the boarding schools were like for many Native-Americans, including performer and Indian activist Floyd Red Crow Westerman.